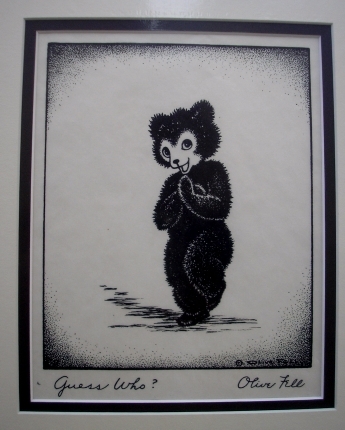 Etching by Olive Fell, Cody, Wyoming, entitled "Guess Who?". Shows a coy little bear with a smirk on his or her face. Signed and titled in the print. Circa 1930. Fell was a print maker from Cody who lived on a large ranch and garnered inspiration from her surroundings. Unframed, but matted. Size: Actual 8" High x 6" Wide. Framed: Matted 14.5" High x 12.5" Wide.